Combination of nuts, almonds, dried fruit and chocolate. The perfect nutrient supplier for outdoor activities and long walks. PEANUT, ALMONDs, HAZELNUTs, brazil nut, walnut, pecan, raisin, vegetable oil, salt, MILK chocolate (sugar, cocoa mass, whole MILK powder, cocoa butter, WHEY powder), tapioca dextrin, glucose syrup, preservative: E220 SULPHUR, emulsifier: E322 SOYa lecithin, flavor: vanilla, thickener : E414, coloring: E101, E120, E133, E160a, E171; Glazing agent: E901, E903, E904. May contain traces of SOY, GLUTEN, SESAME, SULPHITES and nuts. Typical trail mix is a snack mix of, a combination of dried fruits, nuts, and, as in our case combined with chocolate, was originally developed as food to be taken on walks as a nutritious snack. 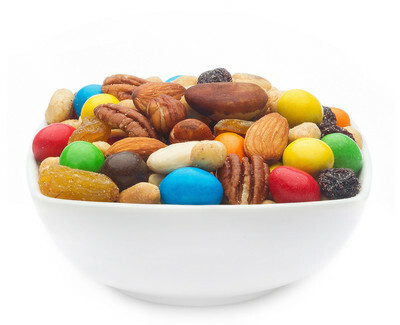 Our TRAIL MIX is, therefore, the perfect snack mix for extended tours and walks, because he kept simple and still is incredibly nutritious and delicious. The natural hazelnuts, pecans, Brazil nuts, almonds, peanuts and walnuts, in combination with our multicoloured sugar-coated chocolate nuts and dried raisins and cherries for the ultimate energy boost. The valuable carbohydrates in our dried fruits and lasting energy from fats in nuts are a secret weapon against nasty cravings. The popular combination of raisins, nuts and chocolate was already in 1910 as TRAIL MIX of Horace Kephart highly recommended in its popular camping guide as the ideal food for long trips and stay in the wilderness. The benefits of this snack are obvious: The hazelnuts, pecans, Brazil nuts, almonds, peanuts and walnuts are durable and virtually incorruptible. Chocolate that ensures the wrapping of our colourful peanuts with a splendid layer for a good mood, supplied with good energy and actually tasteful goods. Raisins and dried cherries provide the fruity-tangy kick, important carbohydrates and the ultimate variety. The classic hiking for a long time was rather reserved as a niche for the pensioners, long tours have been established up to the mountain, hiking on the trails, was running in recent years more and more. The young generation has recognized the lies of locomotion walk a very special appeal. In line with this trend, we have a simple but creative snack from natural nuts, dried fruits and chocolate coated peanuts designed for hiking freaks & cross-country fans, with our TRAIL MIX, which supplies you with everything you need to deliver to the extended tours as energy & good mood. With it in your backpack, You can put yourself on the basics focus: The natural fascination for body & soul.